A mayoral debate hosted by NOWCastSA and sponsored by AARP covered a myriad of issues including gentrification, transportation, and, yes, the controversial vote to keep Chick-fil-A out of the San Antonio International Airport. The event was a unique opportunity to hear incumbent Mayor Ron Nirenberg and his challenger, District 6 Councilman Greg Brockhouse, address political issues and quality of life issues on how the city can remain accessible to people of all ages. 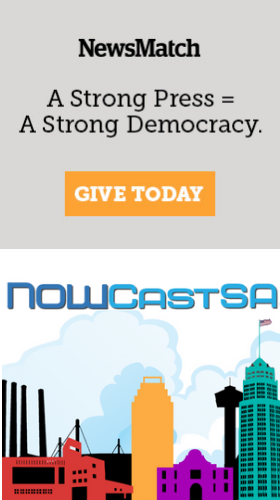 In issuing invitations for this debate, NOWCastSA adopted the Candidate Debate Guidelines carefully prepared by Texas Public Radio, based on principles of editorial integrity and fairness. Those guidelines, “establish viewpoint neutral criteria for candidate inclusion,” by examining the campaign activity, fundraising, newsworthiness of the candidate, and by weighing voter interest, as measured by polls or by percent of votes received in previous campaigns for public office. The event was moderated by San Antonio Express-News columnist Elaine Ayala and livestreamed by NOWCastSA from Palo Alto College’s Performing Arts Center on April 9. Thanks to the financial support of AARP, anyone can watch the debate live or replay it later for free, right on this page. Early voting begins April 22 and election day is May 4. Don't have time to watch the entire debate? Thanks to amazing AARP Intern John Marek, you can scroll down below the video, read the questions and click the links to jump to a particular part of the live stream. A third of San Antonio's population is age 50-plus, and that will continue to grow to about 600,000 people by the year 2020. Are there elements of your proposed agenda that will contribute to ensuring San Antonians, age 50-plus, that can live their best life possible regardless of their zip-code, and if so, what are those elements? What is affordable housing and what does it mean? I live near downtown east of the Alamodome. Property taxes and rent have skyrocketed the past few years. Retired and disabled vet myself, and my community feel we’re being pushed out of our neighborhoods. Studies show that individuals 50-plus make significant economic contributions to their states and their local communities, but job training for older adults who want to learn new job skills within their job or get training in a different field are lacking. What policies and programs would you implement to support the economic engine referred to as the “longevity economy” in San Antonio? What is your vision for senior transportation in the future of San Antonio? San Antonio has one of the lowest rates of voter participation among the twenty largest Texas cities. Regularly, fewer than 12% of San Antonio voters participate in municipal elections. What would you do to increase voter participation in municipal elections? Nearly 9-in-10, that’s 86%, of San Antonians 50-plus say it’s extremely important to live in their own home as they age, and feel it is important to remain in their communities. What specific actions would you take as mayor to set standards for the design and construction of new housing and reconstruction of existing housing that would promote greater accessibility, affordability, increased housing choices, and enable residents to remain in their homes and communities as they age? In 2016, San Antonio was named the least equal city in the country by the Economic Innovation Group. We lead the nation when it comes to the extreme differences between our more prosperous neighborhoods and our more distressed ones. What will you do to close the opportunity and prosperity gap that currently exists in our city? Several people raised questions about the Chick-fil-a vote. Where do you stand? Would you favor the establishment of a homestead exemption for persons under the age of 50? Will Connect SA include older adults’ transportation needs? While 96% of San Antonians surveyed say that sidewalks are in good condition and safe for pedestrians for all abilities, only 45% say that these types of sidewalks exist in their community. What would you do to address this unmet need? How would you approach, or are approaching, some of the top health challenges of San Antonio’s age 50-plus age population as identified by the 2014 AARP Age-Friendly survey, in regards to especially obesity and diabetes? Several people have raised the crime rate, so tell us what the crime rate is in San Antonio and what a mayor can do about it to lower it. Today is an ozone action day. What will you do to help our air quality? Connect SA will take away bus routes and replace them with Mobility on Demand, which is more expensive and you must have a smartphone. Will you support VIA instead of this scheme? Will you support equity based budgeting in the future? Do you understand the reasons for having it in the first place? Would you consider a minimum wage ordinance of $15 an hour? Would you sign onto a petition out there for municipalities to support medicare for all? What is your stand on the problem of homelessness in San Antonio? What can you do for the streets and for the neighborhoods? Today, nearly 1.9 million people live in Bexar County, but the population is expected to grow by another 1.1 million people by the year 2040, maybe sooner. What do you think is the single most important issue that the city must address as we plan this staggering population growth? In AARP’s livable communities survey, San Antonians who are age 50-plus identified the need for programs that would enable residents to age in place in their current homes. Specifically, 78% of respondents identified that home repair service for lower income families and seniors was essential. What policy or program improvements or changes would you make to assist those with this need? What are you going to do about the East Side? So where are we? Why do we have so many scooters downtown? They’re a menace. Help us. What can you do about it? How will you protect our existing neighborhoods from the negative effects of gentrification? Do not take away money from the Edwards Aquifer to fund transit. Water quality is just as important to health and quality of life as mass transit. Editor’s note: This article has been updated since it was originally published on April 3 to recap parts of the debate and make the facts more readily accessible. NOWCastSA staff Charlotte-Anne Lucas and Jolene Almendarez contributed to reporting and an AARP intern John Marek identified the time stamps. This live stream was underwritten by the AARP.